Louisiana Double by Microgaming is the definition of classic video poker games – even the interface is ancient. That is not a bad thing of course, nearly all classic video poker games are like this. But we really want to see some “innovation” in the area of graphical quality nowadays. However, all we get is a horrible looking, at least 30 years old interface with some “beeping” sounds as sound effects. If you play video poker games just for fun and to win some coins, this may not be a problem. But if you want to see nicer and modern graphics, this may not be the game for you. 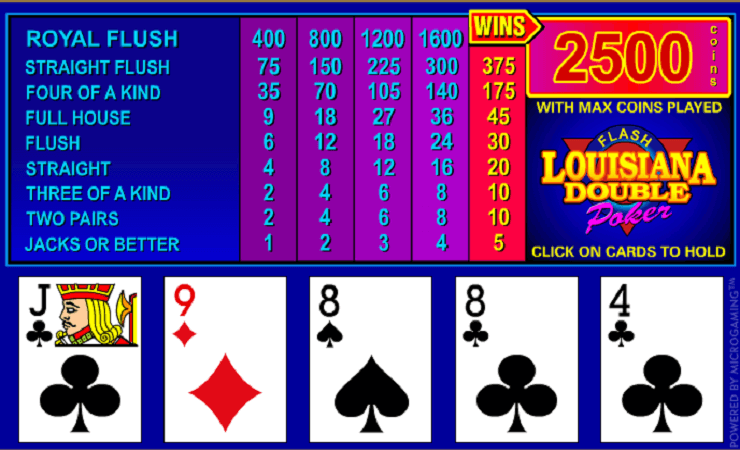 Despite the graphical quality problem, Louisiana Double is a solid video poker game. It offers everything you expect from this category – easy to play, fast pace and satisfying rewards. The interface is divided into two sections, the paytable is at the upper side. As you can see, it has five different rows. The game pays according to classic poker rules and hands, but how much you are going to get depends on how many coins you bet. Each row represents a different bet amount, starting from 5.00 coins per spin and 25.00 coins maximum. To get the biggest payout (2.500 coins) you must play with the maximum coins available. That is why the game asks you to “bet first” before starting the game. To bet, simply click on the row of your choice on the paytable. The rest is easy and simple: click on the “deal” button to get your first drawing. If there are any cards you want to hold, click on those cards with your mouse. (The game automatically holds the cards with a poker value.) After that, click on the “draw” button. You will get new cards in exchange for the ones you discarded, and the final outcome will determine you get a prize or not. The demo credits are pretty high: 100.000 coins. So even if you play with 25.00 coins per spin, this means you can get hours of entertainment for free. The graphics may look old, but Louisiana Double still can deliver a lot of fun and prizes. If you can overlook the graphical quality, this is a recommended game. If not, play at Casino Avenue to find more poker games with nicer graphics!